Web design Employee Portals Intranet Portals | When HRSA-ILA, headquartered in Norfolk, VA approached VISIONEFX to redesign their business website, they wanted a clean, professional design with a custom database application that would securely upload and archive meeting materials, minutes, planning documents and significant reports. Our programmers created a secure, easy to use and administrative portal that can be easily managed in-house. Your business can trust the programming team at VISIONEFX to use the best software for your website application. When searching ‘Web design Employee Portals and Intranet Portals’ look no further than the premier web design professional at VISIONEFX. No portal development is too hard for our expert programming team! Let us know your website portal needs. VISIONEFX, a Web design company based in Virginia provides extraordinary web design for small and large businesses throughout the United States. Our services include; Custom web design, Web development, Ecommerce web design, Word Press web design, Joomla web development, SEO and Website maintenance services. Call: (757) 619-6456 or email info@visionefx.net. 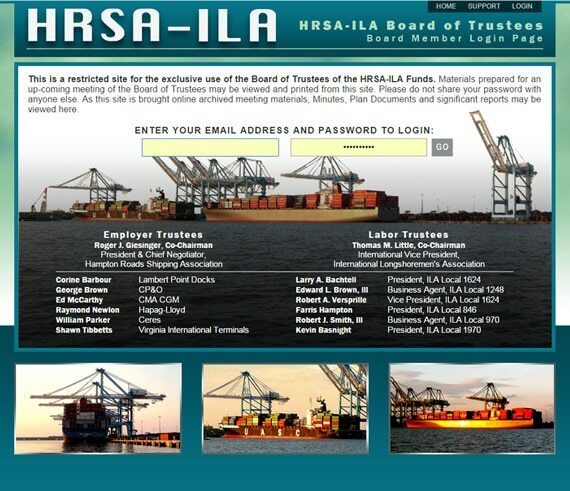 "HRSA-ILA Board of Trustees portal"